The UK Perspectives collection contains colour aerial survey photography of locations in England and Wales. UK Perspectives (UKP) was a partnership between two of the UK's major mapping companies, Simmons Aerofilms and NRSC Ltd. 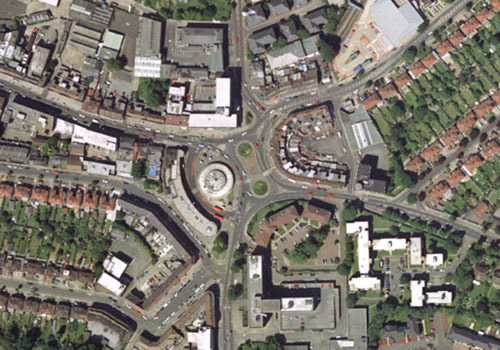 Launched in 1998, in competition with Getmapping's Millennium Map project, the UKP project was called the Millennium Aerial Photographic Survey (MAPS). The two partners used their own photographic survey aircraft, equipped with metric cameras, to acquire colour aerial photography at a uniform scale of 1:10,000. Predominantly geared to the commercial market, from the outset the partners offered ortho-rectified imagery for professional use. Although the project had 'UK' in its title, the partners only collected photography of England and south Wales; other areas were not considered to be economically viable. An example image from the UKP Collection, showing Southgate, London, in June 2000. Following the separate take-over of both of the partners, the project was dissolved in 2005. The collection of original rolls of aerial film was transferred to the management of NCAP in 2015.